I was just craving a massive Cape Town Gatsby this week… mmmmmmmm. Thanks for the memories! Erm… Bev, no… I was just passing by and never actually had a gatsby. :) But yes, I can imagine that a diet filled with this type of food wouldn’t be all too healthy. This is a really fantastic photo Paul! It’s so distinctly South African! Keep up the good work! Odd…the messiness reminds me of a garbage plate, the food which Rochester (New York) is known for. Never had a garbage plate either, although the garbage plate isn’t a national delicacy like the Gatsby is in SA. Geoff, ah, thanks! I’ve *never* heard of a Garbage Plate. It sure looks interesting though. We’ve decided that we’re going to have to visit NYC some time, so I’ll make sure that we try it out. (And let you know ;) ). Hey all just to let U know I had a Gatsby from Munchies take away in Parkland /Tableview and it was so tasty….and best off all the prices was great for a full steak Gatsby it is R50-00 AND a full Russion is R30-00 … so if you guys are looking for good gatsby’s and burgers try Munchies .. Recommend Munchies in tableview and cosy corner in wynberg hmmmmmmm yummy! 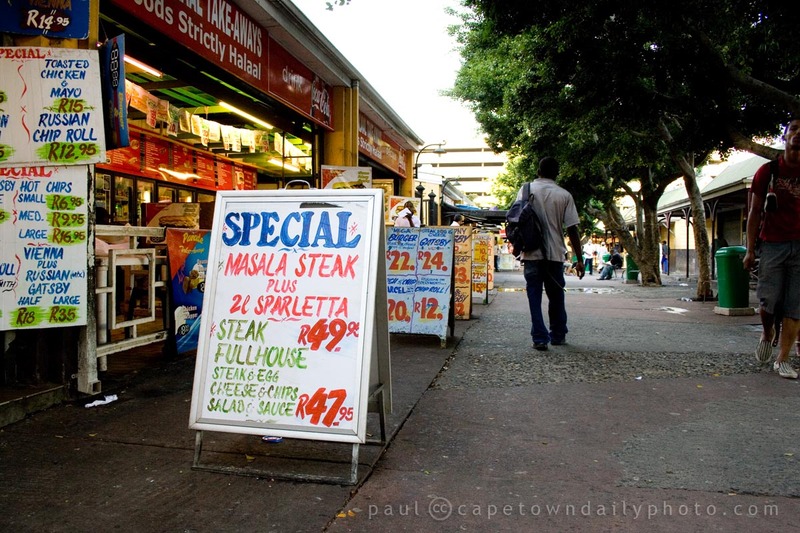 Had lunch today @ Pickbel Halaal Take-Aways in Pickbel Centre Strand Street Cape Town. Just had to say, worst customer service ever!!!! Served spoilt mini chicken pizzas n would not refund nor exchange! Watch what you eat out of the front food glass counter, These foods are exposed all day, with flies looming around n lights shining on the foods – no wonder its always old!